Retail giant Amazon has announced Scout Elf Express Delivers Letters to Santa as one of its Top 10 Toys for Christmas 2017. The Elf on the Shelf® is sprinkling a little more magic into families’ homes this Christmas, with the launch of its brand NEW Scout Elf Express Delivers Letters to Santa. 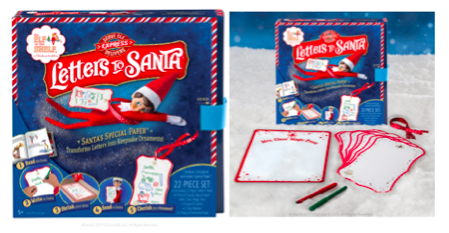 A festive phenomenon featuring Santa’s Special Paper™, which shrinks letters to elf-size so that the Scout Elves can hand-deliver the tiny messages to Santa! Following tradition, children write their letter to Santa on Santa’s Special Paper™ and, with the help of a grown-up, place it on Mrs. Claus’ Magic Press before popping it in the oven for just a few minutes. When it’s ready, the letter will have magically shrunk – small enough for a Scout Elf to take back to the North Pole that night, and personally see that it’s delivered to Santa! Once Santa has seen the message, the Scout Elf brings the letter home and displays it on the Christmas tree as a keepsake ornament for all to see. Scout Elf Express Delivers Letters to Santa is the fastest way to ensure the traditional ‘Christmas List’ letter gets to Santa on time. It also brings a little more family fun to homes in the run up to Christmas! Each Scout Elf Express Delivers Letters to Santa box set comes with a beautifully illustrated storybook, eight pieces of Santa’s Special Paper™, Mrs. Claus’ Magic Press, eight ribbon sashes, two markers and two sheets of parchment paper.